Hey. I'm Vacant! I've played a Rogue on Tichondrius since vanilla. My goal with this project is to provide a visually appealing UI that clearly and cleanly presents pertinent information to immensely improve awareness in PVP and PVE situations. This UI is currently tailored for Rogue, Feral Druid, Survival Hunter, Arms Warrior, Frost Mage, Retribution Paladin, Affliction Warlock, Frost Death Knight, Windwalker Monk Havok Demon Hunter and Shadow Priest with other classes and specs on the way! Regardless, the UI is still extremely good for each and every class. -BfA prelaunch event updates. Everything should be working smooth. Post comments if any issues. /sexymap and select: "Use Global Profile". You may have to manually adjust TidyPlates. You can turn nameplates on within Blizzard's interface options. To display enemy castbars under nameplates, you must go into the combat section of Blizzard's interface options and tick the "display castbar under enemy nameplate" option. Also, you will have to adjust the Last Second (diminishing returns icons) positioning and visibility options to your liking. For some reason there is no built-in profile system for this addon. I use this to see my target and focus target's diminishing returns status. I place the icons under each respective frame, lined up with the bottom right edge with growth moving towards the left. I'd like to have these Icons grow downwards in the future. BagBrother - Shows contents of bags/bank for alts. BagNon - Merges all of your bags into one. Bartender 4 - Actions bars / easy hotkey adjustments. BoneFilter - Filters the annoying Broken Bone loot message. Clique - I use this for Tricks of the Trade. It allows me to Shift+Right Click the frame of the person I want to Tricks. Deadly Boss Mods - Disable unless you PVE. Gladius - Arena target frames. kgPanels - Buttons, panels, borders, etc. LastSecond - Displays diminishing returns of your target/focus target. MasterPlan - Removes the annoyances of managing Garrison missions. PetTracker - Shows stable locations on the map, and ability cooldowns of the pet(s) you're facing. Rarity - Displays via Tooltip if the mob you're hovering over drops anything of interest. Titan Panel - Bottom info bar. -Added functionality for Death Knight. -Updated/added many general WeakAuras strings. -Cleaned up several UI elements. 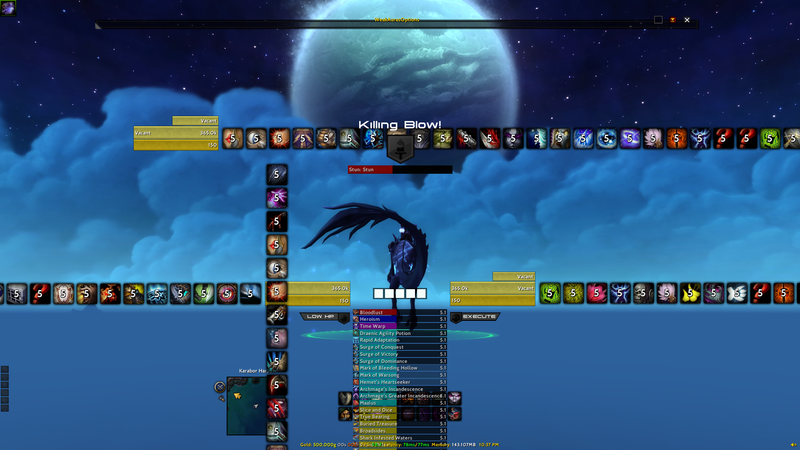 -Organized how certain WeakAuras are displayed. -Added several WeakAuras for, Feral Druid, Rogue, Arms Warrior, Retribution Paladin. Frost Mage, Survival/Marks Hunter. -Configured Grid to display PVP crowd control icons on the unit frame. -New Default Grid profile, moves Grid to the left-hand side of the screen directly under the player buffs. -New Default Grid profile only displays members of your party. (If you want to display the entire raid, you can choose the other profile. 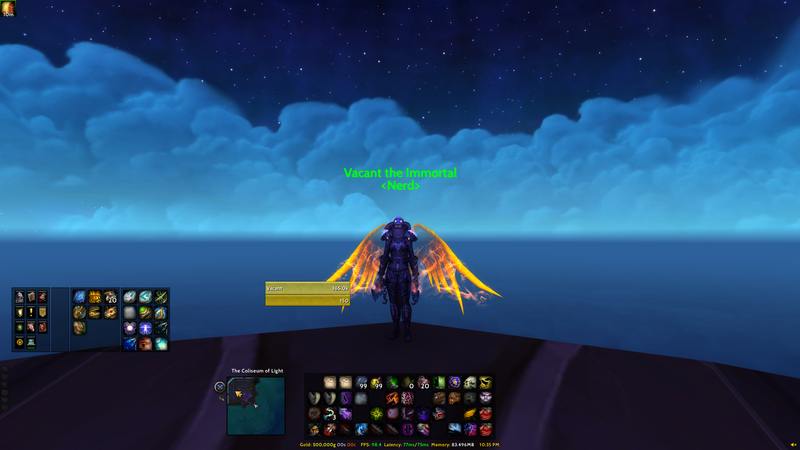 -Added Bartender Profile for Feral Druid (if you are using this with a Druid, you must select Druid rather than Default, when loading the UI on your Druid. -Scrolling Combat Text positioning adjusted. -Skinner removed! Aurora is back! After using Skinner for a bit, I decided that I preferred Aurora. -Skinner now used for in-game Skinning. I feel it looks a bit cleaner than Aurora. Aurora is still included. Simply enable it and disable skinner, if you prefer it! -Skada added. Click the crosshair button to show/hide and control click to reset data. -TidyPlates Raid Icon position adjusted. -Polished the border visuals of several unit frames. -Adjusted Gnosis castbar frames to match. -Added several WeakAuras strings for Hunter, Mage, Rogue, Warrior. -Raid Frame is now skinned. 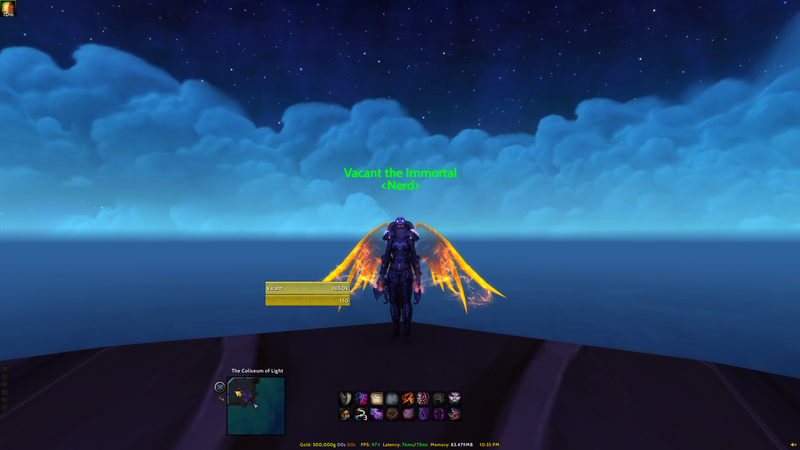 -Changed several bar colors in WeakAuras. -Added bars for several abilities. -Moved placement of DBM alerts. -FINALLY fixed a bug that has been plaguing me for some time now. Apparently there's a bug in Blizzard's UI frame that affects the STRATA(frame level) of certain UI elements making them sometimes unreadable/unclickable. Well, I finally found out that there's an addon called StrataFix that fixes this ANNOYING bug. Hugs and kisses goes to the legendary oscarucb for authoring this addon. That guy rules. For any of you using the UI who have experienced this ridiculously annoying issue, this is now fixed. Beautiful UI! Everything is working perfectly except for my quest tracker on the side. I've moved it with SexyMaps movers but everytime I accept a new quest, it moves the tracker back to the side where it is partially hidden. Any idea how to fix? Sadly im getting a lot of lua errors. Hi, I'd very much like to use this UI for BFA, but I'm having some issues; specifically with the Config.wtf file. When I follow the installation instructions exactly, WoW will not start at all when I attempt to launch. Through some troubleshooting, I was able to determine that if I deleted your Config.wtf file or replaced it with my own, the game would start. However, almost none of the UI mods would load correctly, so this isn't an acceptable work around. I've never seen an issue like this, so I'm unsure how to proceed. I'm not sure why using your config file would prevent the game from loading, or why using mine would cause all the UI mods to break. Weird. It's possible that Blizzard changed something. I'll do some testing in a bit. I recently installed the UI on a separate PC and had no issues at all, so I'll do this again and see what's up. Tested again and everything loaded for me on an alternate PC, with and without the config file present. I'm uploading the latest version of the UI now, let me know how it goes. As long as you follow the directions below, I can't see why it wouldn't, unless there is some weird incompatibility with certain types of hardware, but that seems strange and unlikely. When you edit the folder text for your Account name, Server name and Character name does it matter if all are in caps, or have spaces? My server is Area 52, would I type it as such, or with no spaces? Just the account name in caps, and as far as I know, I don't even think that's a thing any longer. As far as spaces go for sever names, keep the spaces, as is, no underscores. Everything works with your new upload. Thanks! Also, blizzard creates an account name in my WTF folder with random numbers, which is no where near what my account name actually is. Renaming the Account name folder to whatever blizzard puts as my account name made a bunch of things work too. 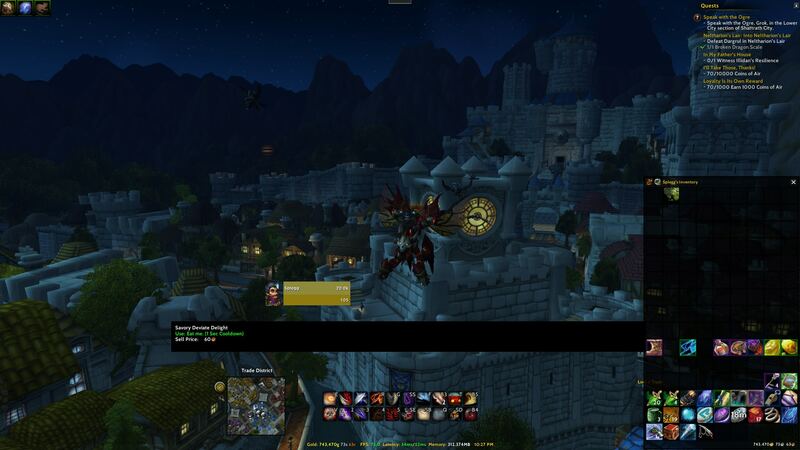 Just in case anyone else has an issue with addons not properly configuring. I have the exact same problem and can't find a solution. Vacant is there a way with this addon pack to change tidy plates loading distance since I am having issues in dungeons to understand what mobs are infront of me , what are bellow/above and what are behind this pack... And also while we are on topic of TP is there a way to enable any sort of highlight on the targeted mob so I know which one I am targeting in the middle of 5-10-15 mob pack . And again thanks for making this UI its performance wise best one I've ever used ( I got way more FPS then I do even without any addons for some reason ) and one of the most if not the most pleasing visually . To change the loading distance of nameplates you navigate to Interface > Addons > Advanced Interface Options > Nameplates - from there, you can fully customize nameplate distance. Currently the highlight color for the mob you have targeted is white (so maybe it's hard to spot); however, you can easily customize this /tidyplates > damage profile. Hopefully that helps! Last edited by V4cant : 08-05-18 at 10:56 AM. Last edited by Longwei : 08-04-18 at 10:39 PM. I love, love, love this pack. I used it back at the start of the last expansion and came back to reinstall for the upcoming game. Everything is working perfectly except for one tiny thing. On the 'first' hover of each item it looks like this on each game load, if i hover over the same item again it shows normally. First of all, huge thanks for using the UI and also supporting it with such kind words. I genuinely appreciate people giving their thoughts and feedback. Now, to get to the Tooltip issue. Good and bad news. I know that it's caused by the addon Auctionator, but have no idea how to fix it. I've tried several things, but sadly I don't have the time to commit to really digging for info in how to get it resolved. I've been looking for an Auctionator replacement, but I'm not 100% pleased with the other options available. As always, I'm very open to suggestions. In the meantime, I just play with Auctionator disabled until I need to use it's functionalities. I hope to get this annoying aesthetic bugged fixed soon.